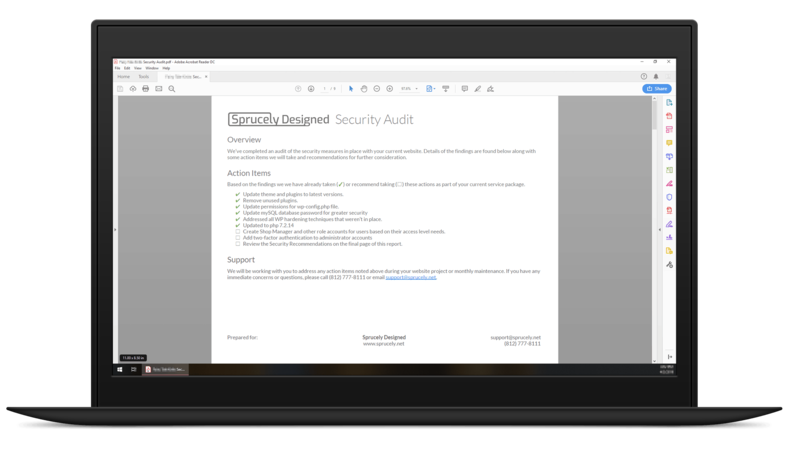 Our comprehensive WordPress Site Security Audit will give you actionable insights into the security of your website. Gain peace of mind knowing that you’re doing what’s needed to minimize the risks of site hacking, data breaches, and malware infections. We’ll send you a full report of our findings including what actions are needed to improve your site’s security. Our 40+ point inspection covers the most imporantant aspects of securing a WordPress site, including hosting configurations, plugin and theme review, and backend frameworks like PHP and MySQL. To complete your audit, we will require access to the admin area of your site along with FTP and control panel access to your hosting. After checkout, we will send you a link to a secure form to provide these access credentials. We do not share these credentials with any 3rd party and expunge them from our records after completing your audit.